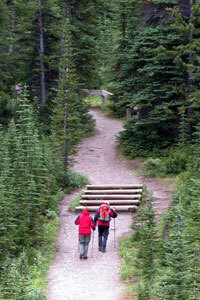 Further along the Icefield Parway on the west side is the pullout/trailhead for Parker Ridge. (At this location you can get great photographs of the south side of Mt. Athabasca and Hilda Peak.) The ridge was named after American climber Herschel Parker and gives you the opportunity to do a beautiful hike with the trail (2.4 km/1.5 mi) rising about 274.3 m/900 ft. I know, you probably don't have the time for hiking now!! But if you are spending a couple of days driving the Icefields Parkway and would like a relatively short hike (2-4 hrs round trip), this is a great one to do. Since the trailhead is near the treeline, you can get the benefits of high elevation without having to do all of the climbing! 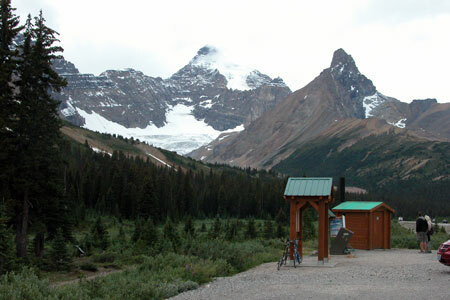 At the end you are treated to an incredible view overlooking the Saskatchewan Glacier to the west, which is the longest flowing glacier from the Columbia Icefield. The trail goes through subalpine forest and tundra to the high alpine, and if you are fortunate (and visiting in mid-summer), you may get to see an unusual sight: watermelon snow. This pink coloration is due to algae living in the snow. I remember being amazed at the snow’s pinkish glow!